No late fee is imposed on candidates who file Form GSTR-4 (applicable for the duration between July, 2017 and September, 2018) between the 22nd of December 2018 to the 31st of March 2019. Dates associated with the GSTR-4. GSTR-4 is a document that needs to be filed once every 3 months by registered tax payers who have signed up for the composition scheme (they are known as composition vendors). The GSTR-4 contains the total value of the sales and supplies made, the tax paid at compounding rate, and invoice-level details of purchases the composition vendor made from other registered tax payers during the tax period. When you make purchases from registered vendors, the information from their sales returns (GSTR-1) will be available in the GSTN portal as GSTR-4A) for you to use in your GSTR-4. Before you file your return, you can check this information, make changes if necessary, and add any details that were not auto-populated. This return can be filed as soon as the relevant quarter ends. The last day to file the GSTR-4 is the 18th of the month following the end of the quarter. For example, if you are filing the GSTR-4 for the July-September quarter, you have to file it before the 24th of December, 2017. You have to be a registered tax payer and a composition vendor under the GST. The aggregate turnover of your business must be less than Rs. 75 lakh per annum. You should be involved in intrastate trade only. You need to keep track of all purchases and imports you have made during this quarter. The first section asks for the year and the quarter for which the GSTR-4 is filed. The following sections ask for the tax details from that period. Your unique PAN-based 15-digit Goods and Services Taxpayer Identification Number. Legal name (as well as trade name, if any) of the registered tax payer or the authorized signatory for your business. a. Aggregate turnover in the preceding financial year: The total value of sales and purchases you made in 2016-2017 minus taxes. This is the only year you will need to provide this — in the future, it will be auto calculated and auto populated. b. Aggregate turnover, April to June, 2017: The value of sales and purchases you made between the start of the fiscal year and the GST rollout. 4. 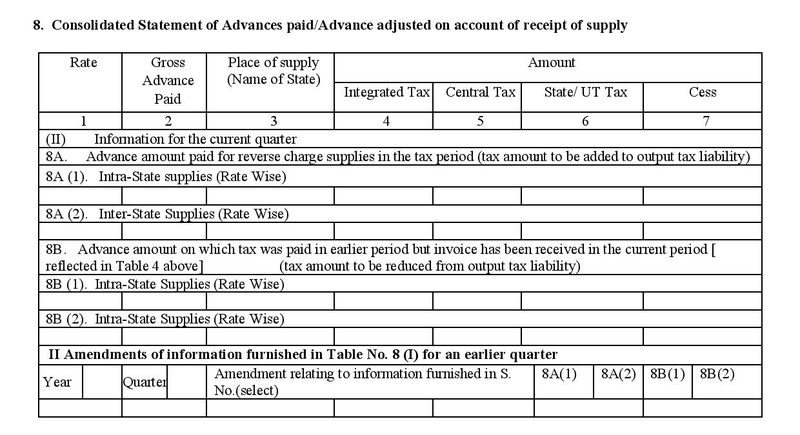 Inward supplies including supplies on which tax is to be paid on reverse charge: This section requires you to capture the details of purchases you have made during this quarter. This includes GSTIN of suppliers, invoice numbers, invoice dates, amounts on the invoice, GST rates of items and services purchased, taxable value, place of supply (the location where you received those goods and services) and the amount of tax paid. 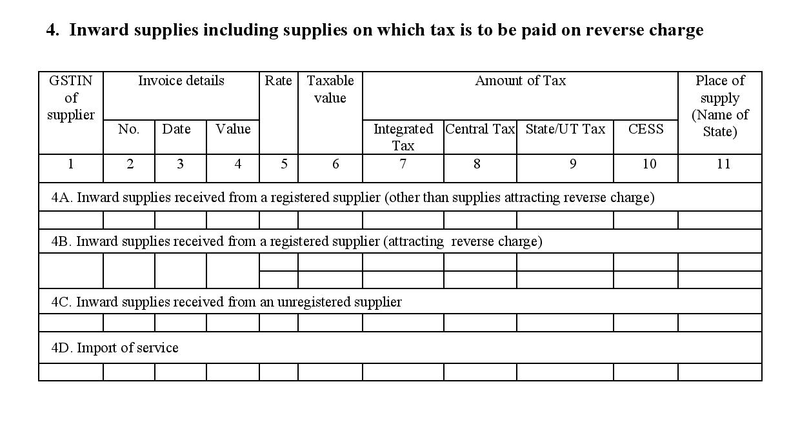 a. Invoice-wise details of all purchases made from registered suppliers (excluding those that attract tax on reverse charge basis). The information furnished here will be auto-populated from the information provided by the suppliers in GSTR-1 and GSTR-5. b. Purchases that attract tax on reverse charge even though you got them from registered vendors. The details furnished here will be auto-populated from the information furnished by suppliers in GSTR-1. c. Purchases made from unregistered suppliers. This has to be manually filled by you since this data will not be available in the GSTN. d. Services that you import from overseas vendors for which you have to pay the appropriate IGST associated with the services received. a. Updates or corrections to the contents of Table 4 from any GSTR-4 returns filed earlier in this financial year. Whenever the place of supply (where you receive the item or service) is different from your registered location, it has to be reported. b. Original debit and credit notes issued to you by your vendors and suppliers, along with the details of the associated invoices. c. Updates to any debit or credit notes issued during earlier tax periods. Include the original unaltered details of each debit note that is being modified. Details of outward supplies (sales), including advances received and net goods returned during this quarter. The details have to be categorised based on the GST rate (0%, 5%, 12%, 18% or 28%) associated to your items and/or services sold along with the turnover made under every bracket and the tax you need to pay at composition rate (which is 1% of turnover for traders, 2% for manufacturers and 5% for restaurants). Modifications to the information under table 6 of previous GSTR-4 returns, can be done under table 7. To do so, you have to specify the details of the original document (Quarter, GST rates, turnover and tax paid at compounding rate) and the details of the modified documents. This will allow the GSTN to calculate the change in your turnover made for that quarter along with the change in your tax liability for the same (the tax you have to pay). Any excess amount paid as tax during that quarter will be adjusted for this quarter (same applies for any dues that you have to pay, arising due to the change in taxable turnover). a. Part (I) captures the details of both intrastate and interstate purchases for which tax is levied on reverse charge basis and you have paid an advance during the current tax period. Also include the details of purchase transactions for which you have paid an advance during an earlier tax period but only received the full invoice during this quarter. b. Part (II) is used for correcting incorrect data and updates to part (I) of Table 8 of previous GSTR-4 returns. Details of any tax deducted at source by customer will be automatically updated here. This includes GSTIN of the customer, the gross value on the invoice and the amount of tax deducted. For example, an electronic showroom hires your services to fix a certain electronic gadget for one of their customers. Upon fixing it, you give an invoice to the showroom. If the showroom deducts tax on your invoice amount and pays you the balance, then in this case, this tax deducted at source (TDS) will be made available to you as credit (in the form of TDS credit). Under this section, you should mention details of the tax you have paid and the tax you still owe for the current quarter under the various tax heads (IGST, CGST, SGST or UTGST, and Cess). The tax payable will be calculated using the data under Table 4, 6, 8 and 9. This table applies mostly to tax defaulters who have been penalised for late submission of returns, late payment or incorrect data filed. Penalties and additional charges paid and owed by you to the tax authority are to be captured here. Under certain circumstances, if the tax that you owe is less than the projected amount, then the difference between the two will be refunded to you. You can find the details of such instances in this section. 13. Debit entries in cash ledger for tax or interest payment: This section will be auto-populated after payment of tax and submission of the GSTR-4. At the end of the document, there is a declaration of truth that needs to be signed by the authorized signatory of your company either by Digital Signature Certificate (DSC) or Aadhar based verification. Are there any other returns that need to be filed by composition vendors? Apart from having to file the GSTR-4 once in every three months, you as a composition vendor, are also required to file an annual return called the GSTR-9 for every financial year. Create GST compliant invoices and file your returns quickly.